There were plenty of laughs and more than a few giggles during comedian Pat Hurley’s presentation to Denair middle and high school students Tuesday morning. His riffs on teen-age sleeping patterns and dirty bedrooms, horror movies and even nursery rhymes entertained both audiences on their first day of school. Hurley told students that it doesn’t matter how big their school is or where it’s at, those six characteristics don’t change. He should know. He grew up in Atwater in the 1950s and ’60s, and then moved to metropolitan areas where he won three Emmy Awards for his work with children’s television. He now lives in Orange County and writes mystery novels in addition to his campus presentations. 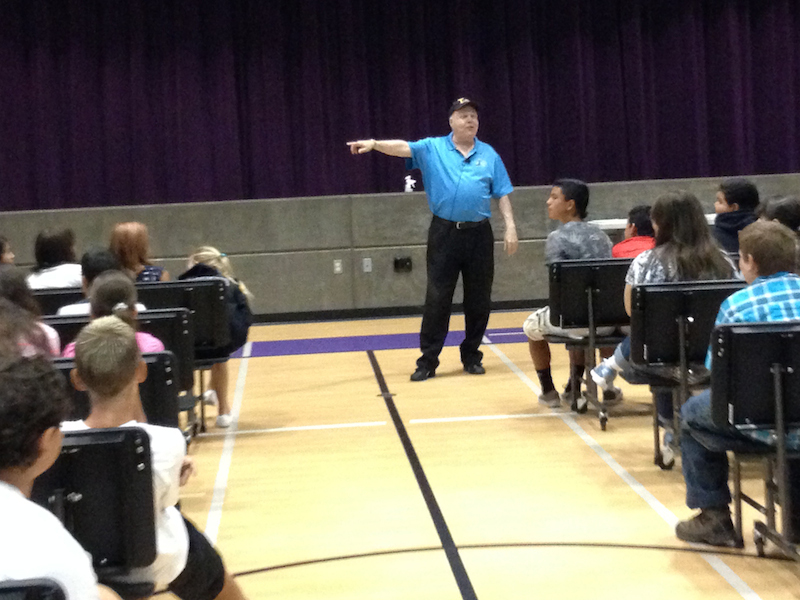 “It’s not the size the school, it’s the quality of the school,” Hurley told about 400 high school students in the gym. Earlier, talking with about 240 middle school students in their multipurpose room, Hurley said one of his measures of any campus is how clean it is. Next, he told his audiences, is the importance of being friendly. He shared personal stories about befriending a boy in high school who was confined to a wheelchair by polio and, as an adult, hugging a man dying of AIDS. Wearing a purple Denair baseball, Hurley talked about the power of words, the pain caused by bullying and the need to respect diversity in all its forms. He related the story of a teen-age girl in Southern California who died of a heart attack related to an eating disorder caused, in part, by verbal bullying. Finally, Hurley spoke of giving back to the community. He shared the example of students at a Florida high school who invited senior citizens to their prom – complete with limo rides and corsages. He challenged students to “quit worrying about yourselves” and come up with a community project for the whole town. “How cool would that be?” he asked. The response from students was overwhelmingly positive. “He talked about everything that happens in high school,” said a Denair High School senior. The anti-bullying message hit home with Denair Middle School eighth-grader Alyce and seventh-grader Trey, while the idea of inviting grandparents to a dance resonated with sixth-graders Brielle and Anthony. Posted in News and tagged comedian, Denair High School, Denair Middle School, Pat Hurley.